Originally published under the title "Turkey: Victim of Its Own Enthusiasm for Jihad." 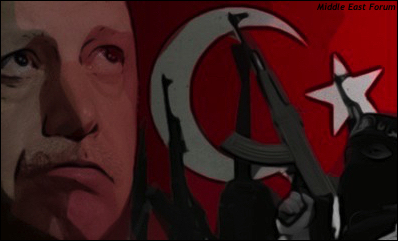 Turkish President Recep Tayyip Erdogan doesn't have his heart in the fight against ISIS. The government big guns in Ankara just shrugged it off when on June 5, 2015, only two days before general elections in the country, homegrown jihadist militants for the Islamic State of Iraq and Syria (ISIS, or ISIL or IS) detonated bombs, killing four people and injuring over 100, at a pro-Kurdish political rally. Then when IS jihadists, in October, killed over 100 people in the heart of Ankara, while targeting, once again, a public rally of pro-peace activists (including many Kurds), the Turkish government put the blame on "a cocktail of terror groups" -- meaning the attack may have been a product of Islamists, far-leftist and Kurdish militants. "IS, Kurdish or far-leftist militants could have carried out the bombing," the prime minister at the time, Ahmet Davutoglu, said. 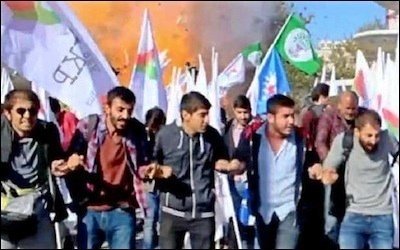 Turkish authorities initially suggested that the October 2015 ISIS terror attack on a Kurdish peace demonstration might have been the work of leftists or Kurds themselves. It was the worst single terror attack in Turkey's history, and the Ankara government was too demure even to name the perpetrators. An indictment against 36 suspects, completed nearly nine months after the attack, identified all defendants as Islamic State members. So there was no "cocktail of terror." It was just the jihadists. In the last year, there had been further jihadist acts of terror, targeting Turks and foreign tourists, but with relatively few casualties up to now. At an Istanbul airport, however, a mysterious explosion, which the authorities hastily attempted to cover up, was probably the precursor of the latest mega-attack in Istanbul. 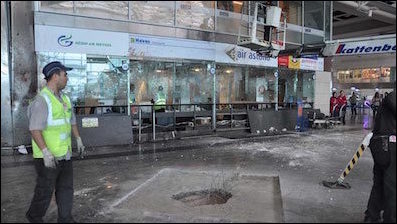 The management at Istanbul's Sabiha Gokcen Airport said on Dec. 23, 2015 that: "There was an explosion at the apron and investigation regarding its cause is progressing ... Fights have resumed." That unidentified explosion consisted of three or four mortars fired at a passenger plane parked at the apron. The attack killed one unfortunate cleaner. Last month's deadly terror attack on Istanbul's airport was preceded by an earlier attack in December that Turkish authorities covered up. Infidels who were enemies of Islam thought they buried Islam in the depths of history when they abolished the caliphate on March 3, 1924 ... We are hopeful, enthusiastic and happy. Some 92 years later... we are shouting out that we will re-establish the caliphate, here, right next to the parliament.